The Rococo Basilica at Ottobeuren (Bavaria): architectural spaces flow together and swarm with life. Rococo ( or ), less commonly roccoco, or "Late Baroque", is an 18th-century artistic movement and style, affecting many aspects of the arts including painting, sculpture, architecture, interior design, decoration, literature, music, and theatre. It developed in the early 18th century in Paris, France as a reaction against the grandeur, symmetry, and strict regulations of the Baroque, especially of the Palace of Versailles. Rococo artists and architects used a more jocular, florid, and graceful approach to the Baroque. Their style was ornate and used light colours, asymmetrical designs, curves, and gold. Unlike the political Baroque, the Rococo had playful and witty themes. The interior decoration of Rococo rooms was designed as a total work of art with elegant and ornate furniture, small sculptures, ornamental mirrors, and tapestry complementing architecture, reliefs, and wall paintings. The Rococo was also important in theatre. The book The Rococo states that no other culture "has produced a wittier, more elegant, and teasing dialogue full of elusive and camouflaging language and gestures, refined feelings and subtle criticism" than Rococo theatre, especially that of France. By the end of the 18th century, Rococo was largely replaced by the Neoclassic style. In 1835 the Dictionary of the French Academy stated that the word Rococo "usually covers the kind of ornament, style and design associated with Louis XV's reign and the beginning of that of Louis XVI". It includes therefore, all types of art from around the middle of the 18th century in France. The word is seen as a combination of the French rocaille (stone) and coquilles (shell), due to reliance on these objects as decorative motifs. The term may also be a combination of the Italian word "barocco" (an irregularly shaped pearl, possibly the source of the word "baroque") and the French "rocaille" (a popular form of garden or interior ornamentation using shells and pebbles) and may describe the refined and fanciful style that became fashionable in parts of Europe in the 18th century. Owing to Rococo love of shell-like curves and focus on decorative arts, some critics used the term to derogatively imply that the style was frivolous or merely modish. When the term was first used in English in about 1836, it was a colloquialism meaning "old-fashioned". The style received harsh criticism and was seen by some to be superficial and of poor taste, especially when compared to neoclassicism; despite this, it has been praised for its aesthetic qualities, and since the mid-19th century, the term has been accepted by art historians. While there is still some debate about the historical significance of the style to art in general, Rococo is now widely recognized as a major period in the development of European art. 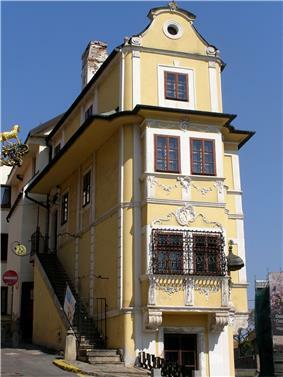 Rococo-style House of the Good Shepherd in Bratislava (Slovakia) - an example of the 18th century bourgeoisie house. 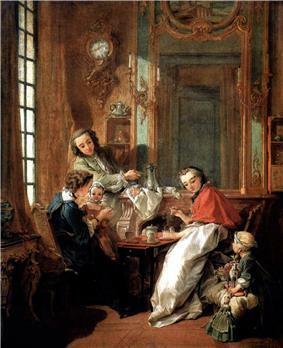 François Boucher, Le Déjeuner, (1739, Louvre), shows a rocaille interior of a French bourgeois family in the 18th century. The porcelain statuette and vase add a touch of chinoiserie. The beginning of the end for Rococo came in the early 1760s as figures like Voltaire and Jacques-François Blondel began to voice their criticism of the superficiality and degeneracy of the art. Blondel decried the "ridiculous jumble of shells, dragons, reeds, palm-trees and plants" in contemporary interiors. By 1785, Rococo had passed out of fashion in France, replaced by the order and seriousness of Neoclassical artists like Jacques-Louis David. In Germany, late 18th century Rococo was ridiculed as Zopf und Perücke ("pigtail and periwig"), and this phase is sometimes referred to as Zopfstil. Rococo remained popular in the provinces and in Italy, until the second phase of neoclassicism, "Empire style", arrived with Napoleonic governments and swept Rococo away. There was a renewed interest in the Rococo style between 1820 and 1870. The British were among the first to revive the "Louis XIV style" as it was miscalled at first, and paid inflated prices for second-hand Rococo luxury goods that could scarcely be sold in Paris. But prominent artists like Eugène Delacroix and patrons like Empress Eugénie also rediscovered the value of grace and playfulness in art and design. The lighthearted themes and intricate designs of Rococo presented themselves best at a more intimate scale than the imposing Baroque architecture and sculpture. It is not surprising, then, that French Rococo art was at home indoors. Metalwork, porcelain figures and especially furniture rose to new pre-eminence as the French upper classes sought to outfit their homes in the now fashionable style. Rococo style took pleasure in asymmetry, a taste that was new to European style. This practice of leaving elements unbalanced for effect is called contraste. During the Rococo period, furniture was lighthearted, physically and visually. The idea of furniture had evolved to a symbol of status and took on a role in comfort and versatility. Furniture could be easily moved around for gatherings, and many specialized forms came to be such as the fauteuil chair, the voyeuse chair, and the berger en gondola. Changes in design of these chairs ranges from cushioned detached arms, lengthening of the cushioned back (also known as "hammerhead") and a loose seat cushion. Furniture was also freestanding, instead of being anchored by the wall, to accentuate the lighthearted atmosphere and versatility of each piece. Mahogany was widely used in furniture construction due to its strength, resulting in the absence of the stretcher as seen on many chairs of the time. Also, the use of mirrors hung above mantels became ever more popular in light of the development of unblemished glass. In a full-blown Rococo design, like the Table d'appartement (c. 1730), by French designer J. A. Meissonnier, working in Paris (illustration, below), any reference to tectonic form is gone: even the marble slab top is shaped. Apron, legs, stretcher have all been seamlessly integrated into a flow of opposed c-scrolls and "rocaille." The knot (noeud) of the stretcher shows the asymmetrical "contraste" that was a Rococo innovation. Most widely admired and displayed in the "minor" and decorative arts its detractors claimed that its tendency to depart from or obscure traditionally recognised forms and structures rendered it unsuitable for larger scale projects and disqualified it as a fully architectural style. Dynasties of Parisian ébénistes, some of them German-born, developed a style of surfaces curved in three dimensions (bombé), where matched veneers (marquetry temporarily being in eclipse) or vernis martin japanning was effortlessly complemented by gilt-bronze ("ormolu") mounts: Antoine Gaudreau, Charles Cressent, Jean-Pierre Latz, Jean-François Oeben, Bernard II van Risamburgh are the outstanding names. French designers like François de Cuvilliés, Nicholas Pineau and the Italian Bartolomeo Rastrelli exported Parisian styles in person to Munich and Saint Petersburg, while Turin-born Juste-Aurèle Meissonier found his career at Paris. The guiding spirits of the Parisian rococo were a small group of marchands-merciers, the forerunners of modern decorators, led by Simon-Philippe Poirier. In French furniture the style remained somewhat more reserved, since the ornaments were mostly of wood, or, after the fashion of wood-carving, less robust and naturalistic and less exuberant in the mixture of natural with artificial forms of all kinds (e.g. plant motives, stalactitic representations, grotesques, masks, implements of various professions, badges, paintings, precious stones). The word 'Rococo' is derived from the French "rocaille", a word used to describe the rock and shell work of the Versailles grottoes. Many pieces of carved furniture dating from the 18th century—in particular, mirror frames—depict rocks, shells, and dripping water in their composition, frequently in association with Chinese figures and pagodas. the Queluz National Palace in Portugal was one of the last Rococo buildings to be built in Europe. Rococo architecture, as mentioned above, was a lighter, more graceful, yet also more elaborate version of Baroque architecture, which was ornate and austere. Whilst the styles were similar, there are some notable differences between both Rococo and Baroque architecture, one of them being symmetry, since Rococo emphasised the asymmetry of forms, whilst Baroque was the opposite. The styles, despite both being richly decorated, also had different themes; the Baroque, for instance, was more serious, placing an emphasis on religion, and was often characterized by Christian themes (as a matter of fact, the Baroque began in Rome as a response to the Protestant Reformation); Rococo architecture was an 18th-century, more secular, adaptation of the Baroque which was characterized by more light-hearted and jocular themes. Other elements belonging to the architectural style of Rococo include numerous curves and decorations, as well as the usage of pale colours. 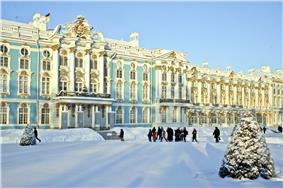 There are numerous examples of Rococo buildings as well as architects. Amongst the most famous include the Catherine Palace, in Russia, the Queluz National Palace in Portugal, the Augustusburg and Falkenlust Palaces, Brühl, the Chinese House (Potsdam) the Charlottenburg Palace in Germany, as well as elements of the Château de Versailles in France. Architects who were renowned for their constructions using the style include Francesco Bartolomeo Rastrelli, an Italian architect who worked in Russia and who was noted for his lavish and opulent works, Philip de Lange, who worked in both Danish and Dutch Rococo architecture, or Matthäus Daniel Pöppelmann, who worked in the late Baroque style and who contributed to the reconstruction of the city of Dresden, in Germany. Rococo architecture also brought significant changes to the building of edifices, placing an emphasis on privacy rather than the grand public majesty of Baroque architecture, as well as improving the structure of buildings in order to create a more healthy environment. 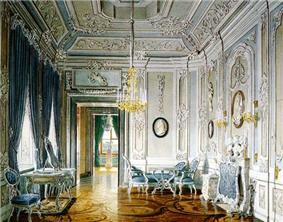 A Rococo interior in Gatchina. Solitude Palace in Stuttgart and Chinese Palace in Oranienbaum, the Bavarian church of Wies and Sanssouci in Potsdam are examples of how Rococo made its way into European architecture. 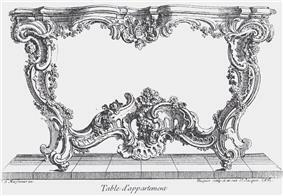 In those Continental contexts where Rococo is fully in control, sportive, fantastic, and sculptured forms are expressed with abstract ornament using flaming, leafy or shell-like textures in asymmetrical sweeps and flourishes and broken curves; intimate Rococo interiors suppress divisions of architrave, frieze, and cornice for the picturesque, the curious, and the whimsical, expressed in plastic materials like carved wood and above all stucco (as in the work of the Wessobrunner School). Walls, ceiling, furniture, and works of metal and porcelain present a unified ensemble. The Rococo palette is softer and paler than the rich primary colors and dark tonalities favored in Baroque tastes. A few anti-architectural hints rapidly evolved into full-blown Rococo at the end of the 1720s and began to affect interiors and decorative arts throughout Europe. 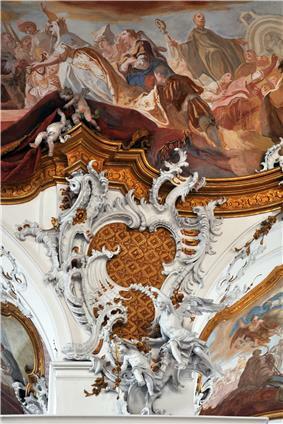 The richest forms of German Rococo are in Catholic Germany (illustration, above). Rococo plasterwork by immigrant Italian-Swiss artists like Bagutti and Artari is a feature of houses by James Gibbs, and the Franchini brothers working in Ireland equalled anything that was attempted in Great Britain. Inaugurated in some rooms in Versailles, it unfolds its magnificence in several Parisian buildings (especially the Knobelsdorff, etc.) effected the dignified equipment of the Amalienburg near Munich, and the castles of Würzburg, Potsdam, Charlottenburg, Brühl, Bruchsal, Solitude (Stuttgart), and Schönbrunn. In Great Britain, one of Hogarth's set of paintings forming a melodramatic morality tale titled Marriage à la Mode, engraved in 1745, shows the parade rooms of a stylish London house, in which the only rococo is in plasterwork of the salon's ceiling. Palladian architecture is in control. Here, on the Kentian mantel, the crowd of Chinese vases and mandarins are satirically rendered as hideous little monstrosities, and the Rococo wall clock is a jumble of leafy branches. In general, Rococo is an entirely interior style, because the wealthy and aristocratic moved back to Paris from Versailles. Paris was already built up and so rather than engaging in major architectural additions, they simply renovated the interiors of the existing buildings. Though Rococo originated in the purely decorative arts, the style showed clearly in painting. These painters used delicate colors and curving forms, decorating their canvases with cherubs and myths of love. Portraiture was also popular among Rococo painters. Some works show a sort of naughtiness or impurity in the behavior of their subjects, showing the historical trend of departing away from the Baroque's church/state orientation. Landscapes were pastoral and often depicted the leisurely outings of aristocratic couples. Antoine Watteau, Pilgrimage on the Isle of Cythera (1717, Louvre) captures the frivolity and sensuousness of Rococo painting. Jean-Antoine Watteau (1684–1721) is generally considered the first great Rococo painter. He had a great influence on later painters, including François Boucher (1703–1770) and Jean-Honoré Fragonard (1732–1806), two masters of the late period. Even Thomas Gainsborough's (1727–1788) delicate touch and sensitivity are reflective of the Rococo spirit. Élisabeth-Louise Vigée-Le Brun's (1755–1842) style also shows a great deal of Rococo influence, particularly in her portraits of Marie Antoinette. Other Rococo painters include: Jean François de Troy (1679–1752), Jean-Baptiste van Loo (1685–1745), his two sons Louis-Michel van Loo (1707–1771) and Charles-Amédée-Philippe van Loo (1719–1795), his younger brother Charles-André van Loo (1705–1765), and Nicolas Lancret (1690–1743). Both Jean-Baptiste-Siméon Chardin (1699–1779) and Jean-Baptiste Greuze (1725–1805), were important French painters of the Rococo era who are considered Anti-Rococo. During the Rococo era Portraiture was an important component of painting in all countries, but especially in Great Britain, where the leaders were William Hogarth (1697–1764), in a blunt realist style, and Francis Hayman (1708–1776), Angelica Kauffman who was Swiss, (1741–1807), Thomas Gainsborough and Joshua Reynolds (1723–1792), in more flattering styles influenced by Anthony van Dyck (1599–1641). While in France during the Rococo era Jean-Baptiste Greuze was the favorite painter of Denis Diderot (1713–1785), and Maurice Quentin de La Tour (1704–1788), Alexander Roslin(1718–1793) Élisabeth Vigée-Lebrun were highly accomplished portrait painters and history painters. Sculpture was another area where the Rococo was widely adopted. Étienne-Maurice Falconet (1716–1791) is widely considered one of the best representatives of French Rococo. In general, this style was best expressed through delicate porcelain sculpture rather than imposing marble statues. 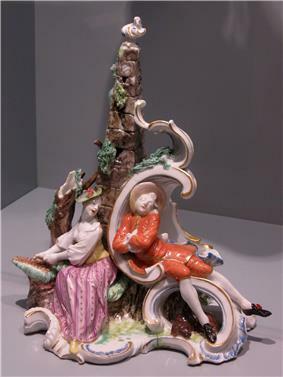 Falconet himself was director of a famous porcelain factory at Sèvres. The themes of love and gaiety were reflected in sculpture, as were elements of nature, curving lines and asymmetry. The sculptor Edmé Bouchardon represented Cupid engaged in carving his darts of love from the club of Hercules (illustration); this serves as an excellent symbol of the Rococo style—the demigod is transformed into the soft child, the bone-shattering club becomes the heart-scathing arrows, just as marble is so freely replaced by stucco. In this connection, the French sculptors, Jean-Louis Lemoyne, Jean-Baptiste Lemoyne, Robert Le Lorrain, Louis-Simon Boizot, Michel Clodion, and Pigalle may be mentioned in passing. An insight into the French term "galante" can be seen through Boucher's painting Le Déjeuner (above), which provides a glimpse of the society which Rococo reflected. "Courtly" would be pretentious in this upper bourgeois circle, yet the man's gesture is gallant. The stylish but cozy interior, the informal decorous intimacy of people's manners, the curious and delightful details everywhere one turns one's eye, the luxury of sipping chocolate: all are "galante." ^ The Rococo - Google Libri. Books.google.it. Retrieved 24 April 2012. ^ a b Ancien Regime Rococo. Bc.edu. Retrieved on 2011-05-29. ^ Kleiner, Fred (2010). Gardner's art through the ages: the western perspective. Cengage Learning. pp. 583–584. ^ a b Rococo Architecture – History of Rococo Architecture – Definition of Rococo Architecture. Architecture.about.com. Retrieved on 2011-05-29. ^ Characteristics of Baroque Architecture. Life123. Retrieved on 2011-05-29. ^ Baroque architecture – Britannica Online Encyclopedia. Britannica.com. Retrieved on 2011-05-29. ^ a b Rococo Architecture. Artsz.org (2008-02-21). Retrieved on 2011-05-29. ^ Parquetry Floors. Datatest.buildingconservation.com. Retrieved on 2011-05-29. Kimball, Fiske (1980). 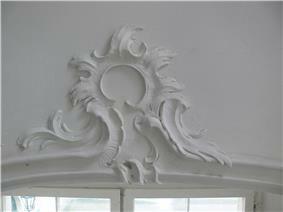 The Creation of the Rococo Decorative Syle. New York: Dover Publications. Arno Schönberger and Halldor Soehner, 1960. The Age of Rococo Published in the US as The Rococo Age: Art and Civilization of the 18th Century (Originally published in German, 1959). Levey, Michael (1980). Painting in Eighteenth-Century Venice. Ithaca: Cornell University Press. Kelemen, Pál (1967). Baroque and Rococo in Latin America. New York: Dover Publications. 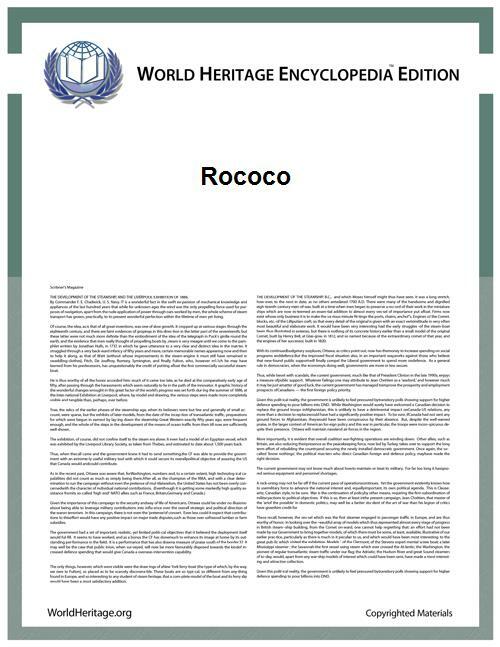 "Rococo Style Guide". British Galleries.